With content review and over 450 sample test questions, this study guide helps you prepare for the Evolve Reach Testing and Remediation Admission Assessment Exam. It includes detailed coverage of each of the subject areas on the exam: math, English, and basic sciences. Topics are simplified with step-by-step explanations, vocabulary, and practice problems with rationales. HESI Hints highlight important concepts and test-taking suggestions. Review questions help you assess your understanding. Chapter introductions emphasize the most important content. Representative exam questions familiarize you with the subject areas and testing format. Coverage includes material tested on each of the exam's three versions - RN, PN, and health professions. 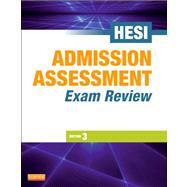 A new introduction explains the Admission Assessment Exam, with information about each of the subject areas tested. A Physics chapter provides preparation for a subject area that may be offered on your Admission Assessment Exam. An expanded math chapter includes a new discussion of military time, word problems, and more practice questions. Practice Tests on Math, Reading Comprehension, Vocabulary and Grammar, Science, and Physics provide over 240 additional questions for exam preparation. An index provides a reference to all topics.